Three virtuosi join together in the exciting group, Trio d’Argento. Sibylle, Peter and Todd bring a superb level of excellence to the performance of their virtuoso arrangements and original pieces, but combine this with a fun, relaxed and conversational atmosphere onstage. The trio has firmly established itself in the Ontario chamber music scene in the past few years, playing to standing ovations and rave audience reviews for many series. 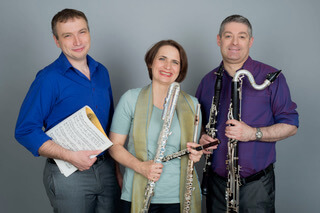 In December 2014, the trio had its Music Toronto debut at the St. Lawrence Centre and has appeared in concerts for the Sarnia, Muskoka, Midland, Orangeville, Gallery 345 Toronto and Brantford Musical Club concert series, at McMaster University, Wilfrid Laurier University, Conrad Grebel University, the University of Guelph and the University of Toronto. They have also performed many times for Caledon Chamber Concerts and the Kitchener Waterloo Chamber Music Society over the past few years. Trio D’Argento has collaborated with First Nations composer and performer Barbara Croall, and is planning to follow up our highly-successful debut recording with members of the Canadian Brass with a disc that will showcase our strong commitment to Canadian music. Plans are also in the works for future tours abroad that will feature some of our ‘greatest hits’ from past Ontario engagements, as well as exciting new repertoire. To that end the trio was recently selected by audition to present showcases to concert presenters at separate contact events in British Columbia and Manitoba. We also continue to develop our educational approach to introducing newer compositions, multi- media experiences and audience- building programs. The trio will be performing for the first time in Quebec in the fall of 2017, at La Maison de la Culture Frontenac in Montreal, as part of an Ontario-Quebec tour, and is busy planning a BC tour for the fall of 2018. From the classics to jazz to exotic world music, these three brilliant musicians provide lively and entertaining concerts with spoken introductions to each piece. Sibylle and Peter play many different sizes of flutes, clarinets and even saxophone, creating a wide and ever- changing array of sound colours, combined with Todd’s powerful pianism. A native of Germany, Sibylle Marquardt moved to Canada in 1997. Her orchestral career began at the early age of 23, when she was regularly hired as 2nd flute/piccolo with the Radio Symphony Orchestra Munich under Sir Colin Davis, touring to Italy and Japan. She went on to join the orchestral program of the Deutsche Oper Berlin and held a solo flute/solo piccolo position at the Freiburg Philharmonic Orchestra under Sir Donald Runnicles. She was a substitute player with the Radio Symphony Orchestra Stuttgart, Deutsche Kammerphilharmonie Bremen, Gärtnerplatz Theater Munich, Bern and Biel Symphony Orchestras. She has also played with the Windsor Symphony, the Toronto Philharmonia and the Oshawa Durham Symphony amongst others, as well as in the productions of the Phantom of the Opera and the Beauty and the Beast in Toronto. Sibylle’s teachers include Hermann Klemeyer, Jean-Claude Gérard and she had lessons with Wolfgang Schulz, Trevor Wye, Geoffrey Gilbert, and Aurèle Nicolet. She has performed in Canada, Germany, Switzerland, Austria, Japan, Italy, former Czechoslovakia and France, as well as for Radio Canada, the BR Munich and TV and movie productions. Sibylle started the Baroque flute 1994 when she was living in Switzerland, taking lessons with Oskar Peters at the School Cantorum Basiliensis, and later with Alison Melville in Toronto and Claire Guimond in Montréal. She is a member of the Camerata Basel. Since 1998 she is on faculty of the Royal Conservatory of Music and a member of the College of Examiners, as well she is the visiting artist at the Etobicoke School for the Arts. 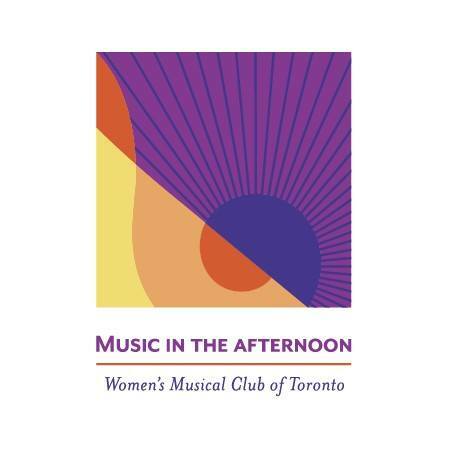 Sibylle has recorded the CD “From The New Village” with guitarist Wilma van Berkel featuring 20th century music and the CD “Piano Centric” with Trio D’Argento and members of the Canadian Brass. Known for his virtuoso energy on stage, creative musical arrangements and an entertaining way of speaking with the audience, Peter Stoll performs regularly in Toronto with many orchestral and chamber groups, and has toured as soloist and with ensembles to the USA, across Europe and to Russia. Recent seasons’ solo and chamber highlights have included a Music Toronto recital with his ensemble Trio d’Argento, the Toronto premiere of a new work by Alexina Louie with the Gryphon Trio, and performances for visits by world-renowned composers Kryzstof Penderecki, Chen Yi and Anders Hillborg. In 2013 Peter was flown to Tokyo, Japan to take part in the international Yamaha “Junior Original Concert” at Bunkamura Hall, and October 2014 saw a three-city tour of mainland China and Hong Kong as part of an exchange of composers and performers organized by the University of Toronto. He recently participated in a recording of re- imagined chamber music with members of the Canadian Brass, due for release in early 2016. Peter teaches clarinet, chamber music, performance studies and “The Business of Music” at the Faculty of Music, University of Toronto. He is also the Winds Discipline Specialist for the Royal Conservatory of Music’s National College of Examiners, and was the chief compiler of the 2014 Clarinet Syllabus. Peter is much sought after as an adjudicator at music festivals across the country. Canadian pianist Todd Yaniw is a young artist praised for his “atmospheric contrast of poetry and power … a hair-raising performance”. Since his debut with the Edmonton Symphony Orchestra at age 13, Mr.Yaniw has performed frequently in Alberta and Ontario; at festivals and venues including the Banff Centre for Music, Edmonton’s Winspear Centre for Music, the Ottawa International Chamber Music Festival, Toronto’s Arts & Letters Club, the Festival of the Sound in Parry Sound, the Richard Bradshaw Amphitheatre and Koerner Hall. Mr.Yaniw has performed with the symphony orchestras of Edmonton, Toronto, Kitchener-Waterloo, Windsor and Guelph. Mr.Yaniw toured the Canadian maritime provinces as a soloist in February 2013, under the auspices of Debut Atlantic. Todd has been interviewed and broadcast on several occasions on the Canadian Broadcasting Corporation [CBC], and Toronto’s Classical 96.3 FM. In December 2012, Todd recorded a one-hour program for the CBC as part of its NEXT series, a radio program at the Monte Carlo Opera House in Monaco, the Jamaica School of Music in Kingston, Jamaica, several concert halls in China and Italy, St.Martin-in-the-Fields and St.James’s Piccadilly in London England and the Eastman Theatre in Rochester, New York. Yaniw’s debut CD “Todd Yaniw: Scriabin, Beethoven, Rachmaninoff, Chopin” was released on the Chestnut Hall Music label in September 2006. 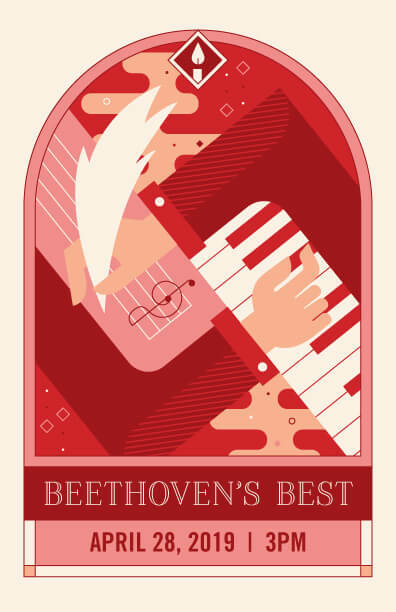 Todd’s extensive prize list includes Winner of the Roy Thomson Hall First Prize at the 2005 Toronto Symphony Volunteer Committee’s TD National Piano Competition; two-time national winner of the Canadian Music Competition, as well as silver medalist at the Eastman International Piano Competition. Mr. Yaniw has been supported by the Canada Council for the Arts, and was a recipient of the 2010 and 2012 Sylva Gelber Music Foundation Awards. Todd Yaniw was born in Edmonton, Alberta and his teachers include Michael Massey, Dr. James Parker, Professor James Anagnoson (The Glenn Gould School), and Dr. Jon Kimura Parker (Rice University). Mr. Yaniw completed his doctorate at the University of Texas at Austin, where he worked with Dr. Anton Nel.